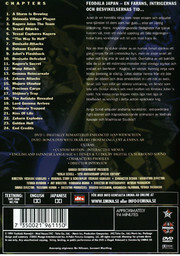 Animé från 1993 av Yoshiaki Kawajiri. Amazing, beautiful and mysterious. “Ninja Scroll” blends the mysticism of 17th Century Japan into an intensely packed tale of pulse-pounding anime action, fantasy and adventure. Directed by the revered Japanese anime veteran Yoshiaki Kawajiri and masterfully rendered by Japan's acclaimed Madhouse animation studio (Perfect Blue and X). 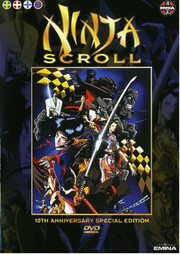 “Ninja Scroll” features a wicked cast of characters and extraordinary fight scenes combined with lightning Samurai action. One of the most critically acclaimed, highly popular and best selling anime films of all time, “Ninja Scroll” has been completely re-mastered and digitally reformatted with the latest Surround Sound audio technology. This exciting new two-disc DVD set offers a pristine presentation of the original full screen feature film plus a newly created Widescreen edition.